In 1985 Texas Instruments stopped the production of the TI-55-II due to the terrible keyboard and introduced the TI-55-III with a reliable far-east style keyboard. As a result the original prostar Flight computer was replaced with this 2nd design using the new housing with the old electronics. 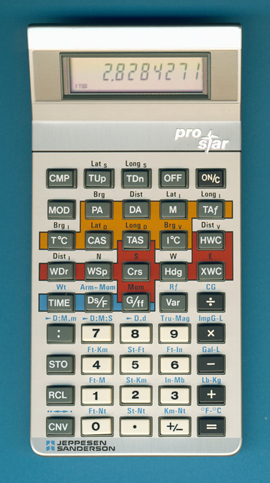 This prostar was the last Jeppesen Sanderson Flight computer based on a TI calculator, the Techstar uses an original design. © Joerg Woerner, December 12, 2002. No reprints without written permission.